Customers within the Kingdom of Becky were shocked this June to find the gates of the castle closed — all five castles, in fact. 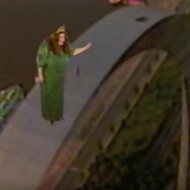 It had been a hell of a ride for the self-proclaimed "Queen of Carpets" whose television ads once featured her flying on a rug over the Arch. And as popular as those ads once made Rothman, few of her customers were happy following her crash landing this summer. Some of those clients complained that the company took their orders the very same Friday that employees were notified that the 58-year-old St. Louis business was closing shop. "I told the congregation yesterday to be angry, but sin not," said the Rev. Robert Reed, whose Bell Grove Missionary Baptist Church placed an unfulfilled order in excess of $3,000. "I will be here every day until we get our funds." In interviews, Rothman cited competition from big-box stores and the economic downturn as reasons she had to pull the plug on her Becky's Carpet and Tile Superstore locations in Fairmont City, St. Peters, Hazelwood, Manchester and south county. Tax documents indicate that the company had been reeling for a while. As of this summer, it owed St. Louis and St. Charles counties some $150,000 in unpaid property taxes, according to public records.